[104 Pages Report] The security advisory services market size is estimated to be USD 5.24 Billion in 2016, at a Compound Annual Growth Rate (CAGR) of 18.7%. The base year considered for the study is 2016, and the market size is calculated from 2017 to 2022. The objective of the report is to define, describe, and forecast the security advisory services market, by service type, organization size, vertical, and region. The report analyzes the opportunities in the market for stakeholders by identifying the high-growth segments of the market. Furthermore, the report profiles the key players of the market and comprehensively analyzes their core competencies, such as new service launches, acquisitions, partnerships, agreements, and collaborations. Moreover, the report also covers detailed information regarding the major factors influencing the growth of the market (drivers, restraints, opportunities, and challenges). 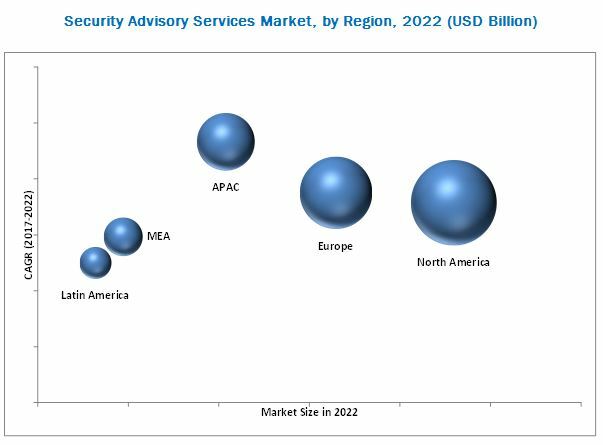 The security advisory services market comprises major vendors, such as EY (UK), PwC (UK), eSentire (Canada), Kudelski Security (Switzerland), Novacoast (US), Security Compass (Canada), Deloitte (US), KPMG (UK), Delta Risk (US), TCS (India), CybeRisk (Israel), and Coalfire (US). The stakeholders include security advisory service providers, consulting firms, cybersecurity vendors, Value-added Resellers (VARs), telecom providers, and Information Technology (IT) security agencies. Detailed analysis and profiling, along with the MicroQuadrant analysis was performed to get detailed information regarding the competitors in the security advisory services market, on the basis of their service offerings and business strategies. The report reviews the major players who offer security advisory services. In addition, the report will outline the findings and analysis on how well each security advisory service vendor performs within the MarketsandMarkets criteria. The security advisory services market is expected to grow from USD 5.77 Billion in 2017 to USD 13.57 Billion by 2022, at a Compound Annual Growth Rate (CAGR) of 18.7%. The rise in security breaches and increased sophistication level of cyber-attacks are said to be the main drivers of the market. The security advisory services market is segmented by service type, organization size, vertical, and region. The security advisory services market by service type includes penetration testing, vulnerability management, risk management strategy, incident response, compliance management, security program development, Chief Information Security Officer (CISO) advisory and support. The CISO advisory and support service type in the market is expected to have the largest market size during the forecast period. The market for the service type segment is expected to be growing, as the individuals, Small and Medium-sized Enterprises (SMEs), and large enterprises are concerned about securing their network infrastructure. The SMEs segment is expected to grow at a higher CAGR during the forecast period, owing to the increasing incidences of data breaches on these enterprises, as well as, rise in the sophistication level of cyber-attacks. SMEs are small in terms of their size, but cater to a large number of customers globally. Robust and comprehensive security solutions are not implemented in SMEs, due to financial constraints in these organizations. However, the large enterprises segment is estimated to account for a larger share of the security advisory services market in 2017. Security advisory services have been deployed across various verticals, including the government and public sector; Banking, Financial Services, and Insurance (BFSI); energy and power; government and public sector; healthcare; IT and telecommunication; transportation; and manufacturing, and others (travel and transportation, retail, and education). The government and public sector vertical is expected to witness the highest CAGR during the forecast period. However, the BFSI vertical is estimated to have the largest market size in 2017. The global security advisory services market has been segmented on the basis of regions into North America, Europe, Asia Pacific (APAC), Middle East and Africa (MEA), and Latin America to provide a region-specific analysis in the report. North America, followed by Europe, is estimated to become the largest revenue-generating region for the security advisory service providers in 2017. The increasing fraudulent activities in various industries is one of the key factors that is expected to fuel the growth of the market in North America. The APAC security advisory services market is said to be gaining traction, as it provides proactive security measures against the evolving data breach techniques. SMEs as well as large enterprises in the APAC region have become more aware of the increasing fradulent activities and started adopting security advisory services to combat them. However, the budget constraints may restrict the security advisory services market growth. The major vendors that offer security advisory services across the globe are EY (UK), PwC (UK), eSentire (Canada), Kudelski Security (Switzerland), Novacoast (US), Security Compass (Canada), Deloitte (US), KPMG (UK), Delta Risk (US), TCS (India), CybeRisk (Israel), and Coalfire (US). 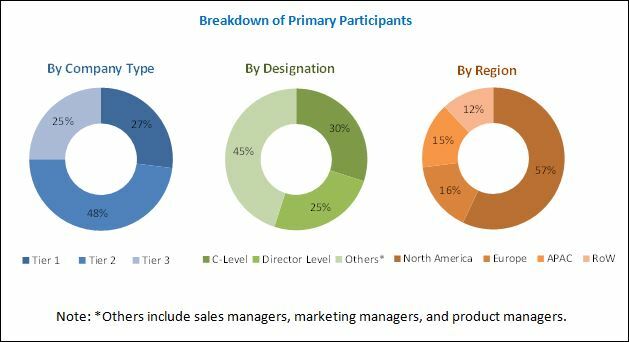 These vendors have adopted various types of organic and inorganic growth strategies, such as new service launches, partnerships and collaborations, and acquisitions, to expand their offerings in the market.